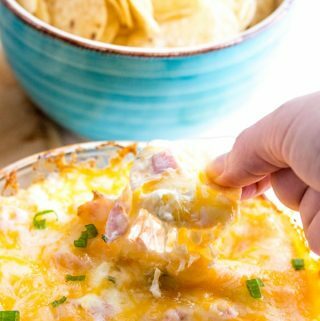 Cheesy, meaty, sweet and creamy this Hawaiian Pizza Dip is a delicious pizza flavored side to go along with your meal! In a bowl combine you cream cheese, onions, ham, pineapple and 1 cup cheeses. Mix until well combined then transfer to oven safe dish. Bake for about 15 minutes until bubbly then top with remaining cheese and return to oven for about 5 more minutes or until cheese is melted.